GOLD James Saves the Moon Adventure! Just wow so surprised and excited. My first book James Saves the Moon was awarded the Gold medal from Readers Favorite International Book Awards Gold Medal Children’s Fantasy /Sci-Fi. https://readersfavorite.com/2014-award-contest-winners.htm#book11891 The awards were announced September 1. I was expecting honorable mention. Here is the review of James Saves the Moon from Readers Favorite. 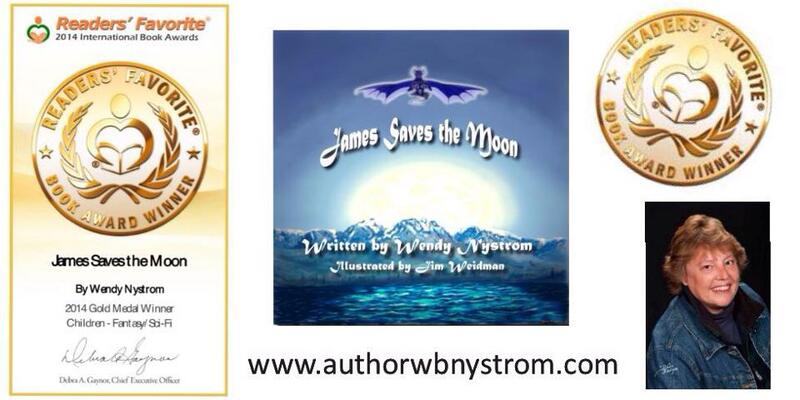 https://readersfavorite.com/book-review/11891 Thank you Readers Favorite reviewers and judges for awarding James Saves the Moon with the gold. 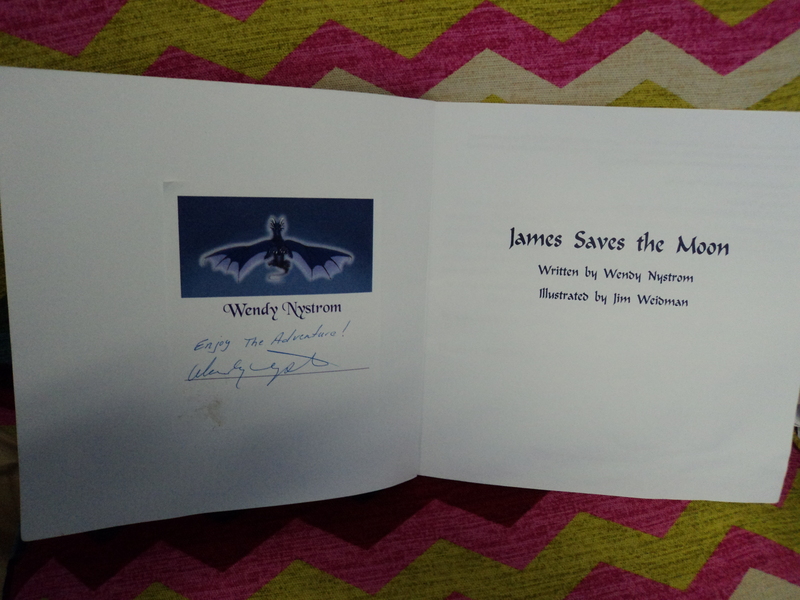 The color of the illustrations by Jim Weidman and the very well-written story by Wendy Nystrom make “James Saves the Moon” a rare treasure for a children’s picture book. 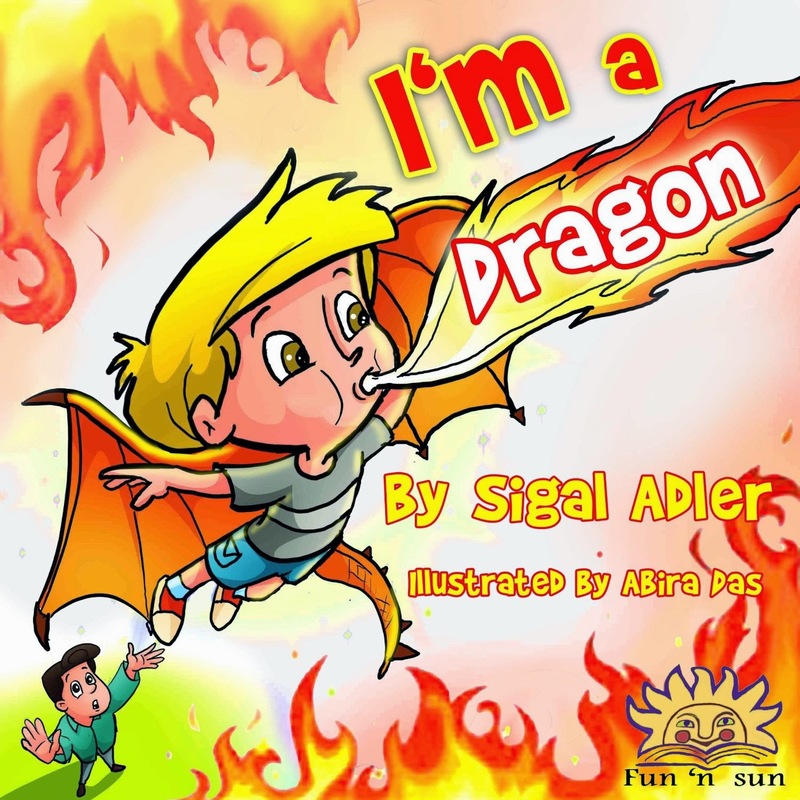 Its simplicity combined with the kind of story that stirs the imagination of a child make it something that will stick in the mind of the reader for a lifetime. This book gives a little bit of a taste of the colorful and flavorful history of Iceland and its traditions. It is highly recommended for its ability to help stir a child’s imagination. A wonderfully simple and delightful tale. Nearly two months since my last post adventure! I certainly hope most people are doing well. I am improving every day. I am going to start with what is happening now then talk what has been going on in my life. First my PA Candice is going to be making some changes to the blog look. Always need to update things once in a while. I want to thank Candice Simpson for updating my social media for me. Just click on cover for Amazon link Kindle is only 99 cents until April 21. We have had wicked storms in my area which knocked our power for a while. We were lucky so far at my house. Many of my friends, neighbors are still without power and water since April 12th. Some other had trees or other objects damage their homes or property. And some are having flooding issues. Now we are getting cold again and may get a little snow. I have anothe r book releasing in May. Been through the editing phase just waiting on the last 6 or so illustrations. It is my best work. 4th in the James and Syvok Adventure. Most of my characters from previous books are involved and a new character has been introduced. What could possibly be inside an iridescent cloud. Lots of action and magic in this adventure. Pretty excited. The best news is I will be able to attend the Book Signing and Award Ceremony Event in Orlando, FL April 26th. I can’t wait. Come see me if you are in Orlando. My other news is I am being featured this week on Kidtales on Facebook. https://www.facebook.com/Kidtales Very nice adventure going on. Every week they will be featuring a new children author. Tomfoolery and 13 Yule Lads of Iceland Release Adventure! I am happy to announce the release of Tomfoolery and 13 Yule Lads of Iceland. Who likes to have fun during the holidays? Well Iceland has fun for 26 days. The Yuletide season starts December 12th with the first of 13 Yule Lads to visit and drop off a treat for well behaved children and cause some mischief while in town. Just click on the picture and it will take you to Amazon purchase links. This is the third adventure for James and Syvok. And as always Matthias the Dragon is always there to help out on the adventure. Join the event we will have fun and prizes and a Rafflecopter with some great books and prizes from me and some of my wonderful friends. Tomfoolery 13 Yule Lads Of Iceland and what do you get? A lot of Tomfoolery and Fun I’ll bet! The Thirteen Yule Lads of Iceland are much different than the Santa Clause we know. They are mischievous, troublesome, funny, and full of curiosity. Much like James, so when James visits them in their home with Syvok, almost gets eaten by their mother and is taunted by the Christmas Cat, they know right where they are going to come when they visit town the 13 days of Christmas. James finds out that the Yule Lads make the noisiest house guests ever when they come to stay. They clang pots, slam doors, and even bring their own lamb. However amidst all the ruckus what they create most of all is joy and fun for the holidays. This is a book you and your kids will want to read all the time and at Christmas Time. It was my favorite story when we lived in Iceland. I add a different spin to the old legend. If you wish to order the book signed just drop me an email at wendysbookcase@gmail.com or If you purchase it some where else online email me with proof of purchase and I will gladly send you an signed bookplate you can place inside. It has been forever and a day since my last post. I really need to get better at blogging. Its the 13th and love that number. I will be on Twitter Chat tonight. Hash tag is #helgareturns come join me at 6:30 pm eastern. I am having problems being clever today. It is pretty cool to see your books on so many blogs. My publisher Anchor Group Publishing set up this up. Love this adventure. If you purchase my books in print or ebook I will gladly send you a signed book plate to adhere inside the cover. Here is what it looks like- Just email me at wendysbookcase@gmail.com or pm on facebook, I would be happy to send you one. I have been working on my novel, and Christmas Book it another James and Syvok Adventure! Always happy when writing. I have another admin who is fabulous her name Candice. I love working with her. The Lil Anchor’s street team is going they are a fab group too and so helpful. Amy my quiet admin is helping me build a website, she helps me with my tech issues, for which I have a lot of them. Check out my pages at the end of this post. Lil Anchors page now has featured kids authors from Anchor Group Publishing. I know cute we call ourselves lil anchors. We also post a joke of the day. They are hilarious. On my kidstale page we now post coloring pages and lots of kids author post about their books too. 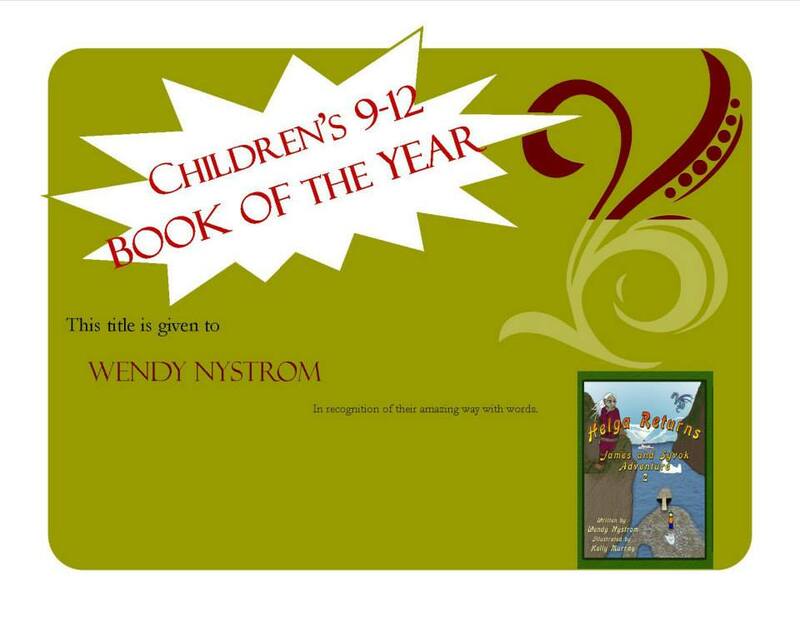 My author page is WendysBookcase. All links at the bottom of this post. Really folks their are way more nice people out there than mean people!